[For ages 12 - 17] Love donuts and want the world to know it? 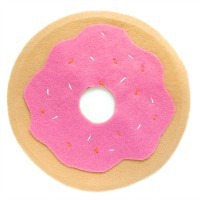 Create your own DIY No-Sew Donut Pillow in this special Tween Crafternoon! We will be using hot glue guns, felt, poly-stuffing, and lots of “sprinkles” to create your own personalized donut pillow. All supplies will be provided, but registration is required due to limited class size. Please register online, or by calling the Reference Desk at 518-436-0254 ext. 223. For ages 12 - 17.